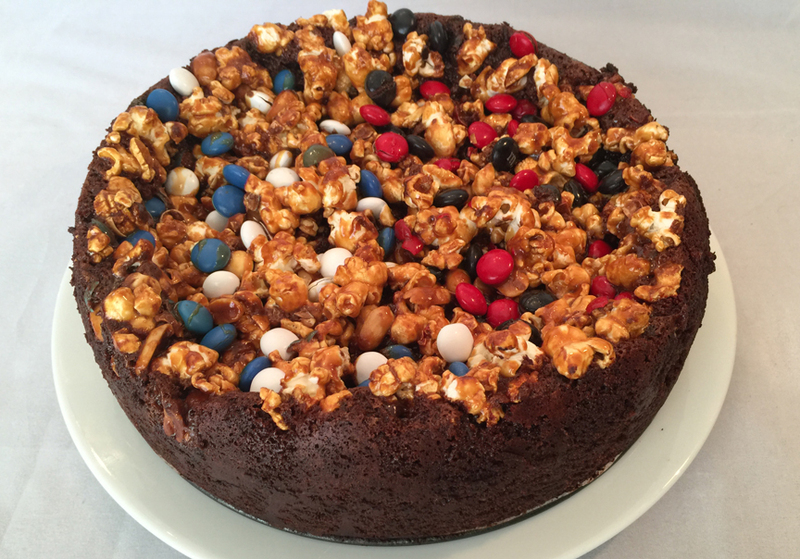 All the football stadium favorites in one delicious treat – a combination of brownie, caramel, popcorn, peanuts, and M&M’s. Select your M&M’s (or any candy coated chocolates) in the same colors as your favorite team. Or make everyone happy and split the topping using half of each team’s colors! Butter a 9“ inch springform pan, Line bottom of pan with a parchment paper round and butter the parchment paper. Sprinkle unsweetened cocoa powder lightly over the butter (replacing flour); dump out any extra. Preheat the oven to 350 degrees. Using a double boiler, melt chocolate and butter together, whisking to combine, set aside to cool. Heat the caramel sauce in a small saucepan to warm. In a bowl whisk together the flour, baking soda and salt. In a large bowl whisk the eggs and sugars together until well blended. Whisk in the corn syrup and the vanilla and then the melted butter and chocolate. Add the dry ingredients, whisking to combine. Pour into the springform pan making an even layer. Place the popcorn and nuts in a large bowl. Pour the caramel over and toss to combine until all the caramel has coated the popcorn and peanuts. Add 2/3 of the M&M’s and toss. Place evenly over the brownies, pressing lightly in to the top of the batter. Sprinkle the remaining M&M’s over the popcorn/caramel mixture. Bake the brownie for 55-60 minutes, or until a knife inserted into the center comes out almost clean. Transfer the pan to a rack and cool for 15 minutes. Run a knife between the brownie and the springform pan and remove the sides. Cool completely. Remove the pan bottom and parchment. Cut in to wedges.